The Multi-lift vertical wheel chair lift offers safe and reliable operation for its users. This ruggedly constructed lift has been proven for both indoor and outdoor applications. 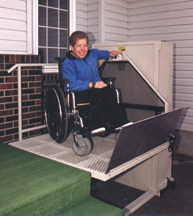 The ES-125 stair wheelchair lift is designed for both residential and commercial use. 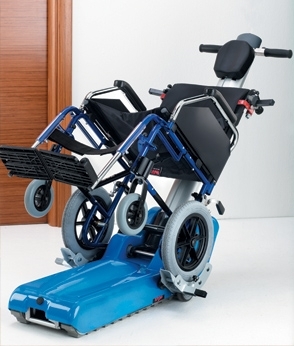 Its compact folding platform leaves the stairway virtually unobstructed when not in use. It can be used both indoors and outdoors. The unique drive and platform combinations of the V-1504 vertical wheel chair platform lift allows for rapid delivery and ease of installation in respect to any architectural requirements. The Roby mobile tracked system allows an operator to move a person in a wheelchair up and down stairs using a motorized traction control system. The Roby is well-suited as an emergency evacuation system for buildings such as schools, banquet halls and other public buildings. Battery powered and portable, the Roby can be used when there is no elevator or lift, or when an elevator or lift cannot be used. After securely fastening the wheelchair to the Roby with its easy-clip system, the operator guides the Roby up or down the stairs. The tracking system grips the stairs to ensure a solid contact and moves along each stair with smooth and quiet operation. The passenger remains in a natural upright position. 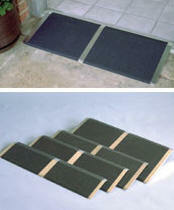 The Roby can be used on stairs up to a 35 degree angle and can be used indoors and outdoors. 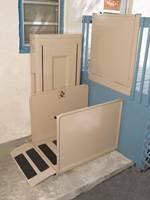 Our residential wheelchair lift or porch lift is a cost effective home accessibility solution that replaces bulky ramp systems. 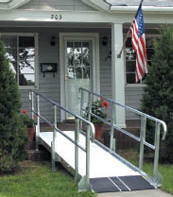 The Ability Lift offers a standard 48" x 48" carriage for 90 degree turns and optional 40" x 54/60" carriages. Accommodates lift heights up to 72". Uses standard household current. CSA certified for electrical safety. Dual, aircraft cable drive system. Weather-sealed drive enclosure. Custom modifications available. WCR530 5' 30" 32 1/4" x 16" x 9" 30 lbs. 600 lbs. WCR630 6' 30" 38 1/4" x 16" x 9" 35 lbs. 600 lbs. WCR730 7' 30" 44 1/4" x 16" x 9" 39 lbs. 600 lbs. WCR830 8' 30" 50 3/4" x 16" x 9 1/2" 52 lbs. 600 lbs. WC1030 10' 30" 62 3/4" x 16" x 9 1/2" 63 lbs. 500 lbs. WC1230 12' 30" 74 3/4" x 16" x 9 1/2" 73 lbs. 500 lbs. - Accommodates a Rise Up to 60"
Handrails Double 11/2" bar – standard Height 36" – 38"